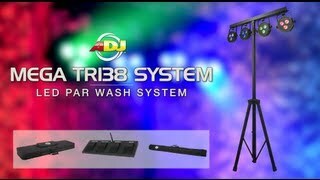 The American DJ Mega TRI38 Sys is a exciting all-in-one LED Wash system for mobile entertainer. This lighting system features 3x 3-Watt TRI Color (3-IN-1 RGB) LEDs, producing bright color washes of light with LEDs rated at an extremely long life of 50,000 hours. Great for any performer on-the-go, the Mega TRI38 Sys is easy to set-up and take down. Plus, with low heat emitting LEDs performers stay cooler on stage. The system includes a tripod stand, a wireless, battery operated foot controller, and two gig bags to help protect your equipment. In addition to it’s built-in programs and the wireless foot controller, the Mega TRI38 Sys may also be controlled by an external DMX Controller via it’s XLR In/Outs, or from the ADJ LED RC wireless remote controller (both sold separately). Considering purchasing the American DJ Mega TRI38 Sys? Have questions? Ask people who've recently bought one. Do you own the American DJ Mega TRI38 Sys? Why not write a review based on your experience with it. Seen a video for American DJ Mega TRI38 Sys online or have you own video? 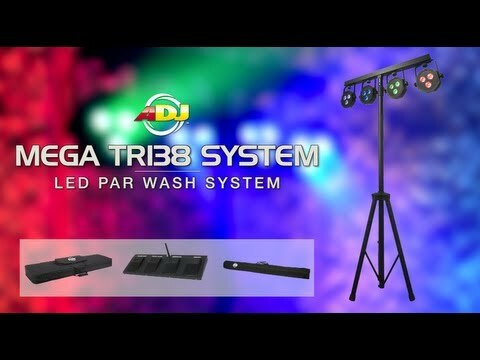 Check out American DJ Mega TRI38 Sys on DJkit.com!